1) What's your favourite curry? 2) What's your favourite beer? 3) Would it be possible for you to send me a signed copy of your latest album? 1. What's your favourite piece? 2. What's the greatest highlight of your career? 3. Can I get your autograph! 2. again so many wonderful memories, but I keep thinking back to the first victory I had with the Desford Band in 1987 at the Royal Albert Hall, it was the most amazing day. 3. certainly Adam, just send me a private message with your address and I'll see to it. 1. What is the earliest age you think a child should start learning euphonium? 2. What mouthpiece would you suggest for a 12-year-old euphonium player? 3. How soon in their development would you introduce a compensating euphonium? 1. I started around the age of 11, and I think this is early enough, and I got to it by the cornet, the tenor horn ( alto horn), and the baritone. I think 11 or 12 is fine. 2. depending on the maturity and strength of this 12 year old, I would probably recommend something like 6 1/2, moving onto a five or four by the age of 15 or so. This is fun and a great service - thank you for taking the time to do this! 2. What is your greatest musical ambition yet to be achieved ? 3. What gives you the most satisfaction, playing or teaching the young to play ? 3.actually equal satisfaction, for different reasons. I was lucky to have fantastic caring teachers in the past, and it's brought me to where I am in my career, and I never forget this, happy to give back whenever possible. 1. What's your favourite piece to play with your instrument ..czardas or carnival of vinice? 2. What's your favourite classical composer? 1. Riffing on Dave Dave Werden's 2): If a new player of any age were to ask you in person which mouthpiece she/he should use, would you begin by taking into account the physical characteristics of the person's mouth? 2. Is there a single, best method book/series for the player who isn't able to arrange for private instruction? 3. Do you regularly try instruments from various manufacturers, and if so, how long does it take you to learn its characteristics? 1. No not really and less their mouth was excessively large or small. Often the best mouthpiece choices based on the amount of air that you think a student is able to use when playing. 3.I don't regularly try other manufacturers instruments, but try to take opportunities at big festivals and exhibitions. I can usually assess an instrument within a couple of minutes if the acoustics are suitable. 1. Some of your playing contains much jazz influence. As not just a euphonium player but a musician, how do you work to develop this? 2. Do you believe that warm up routines should stay consistent or vary day to day? 3. Does your euphonium have a name? So cool of you to do this! 1. I've never studied jazz, but have been around several fantastic musicians over the years, for example at the Brass Band of Battle Creek, and it's inspired me to pick up some habits, an experiment at home from time to time.I'm really enjoying the new foray into this world, but need to spend a lot more time in a dark room learning to improvise freely! 3. no only girls name their instruments!! 1. What's your favourite original composition for baritone? 2. What's your favourite brass band test piece? 3. What footy team do you support?! 1. As someone who has seen a majority of the world traveling, what are career options for euphonium players who wish to "play over seas" and what nations are leading the way in terms of a career for the euphonium? 2. What do you see in the future for the euphonium? 3. What are some good principles of establishing a successful business? Yes, thank you Steven Mead!!! Ok, My first question is in 27 parts... Just kidding. 1. I have a new arrangement for solo euphonium and trombone quartet. Would you like copy? 2. What's your top 5 original euphonium works with piano accompaniment (not ensemble reductions). 3. Any advice on making a recording? 1. Yes absolutely, would love a copy. 3.yes, lots, but not enough space here!! Thanks Steve! I'll get the Chesnokov out to you. This is a great idea about the 3 questions. I noticed that you mentioned that Butterworth past away. When did this happen? Anyway, I would love to catch up sometime. Thanks again! we were talking about Arthur Butterworth, and sadly he passed away last week. A wonderful man, superb composer with such a strong human spirit. 1. what are your practice routines these days? 2. what is your favorite Korean Dish? Will you return in Italy, nearby Milan? Finger crossed! Hope to see you soon! 1. Would you please tell me your top three favorite albums? 2. If you can have have an extra life in the parallel universe, what will you do? 3. If you need to give some advises to graduating students about life, what will you tell them? And again, thank you for doing this! Always a big fan of yours! 2. The same as I'm doing now! 3. follow your dream, never give up, be true to yourself, work hard, and be happy. 1. What do you think would be the best mouthpiece for an average high school student? 2. Favorite brand of valve oil? 3. Is there any way I could get your autograph? Thank you, and it's pretty awesome that you're doing this! 2. there are many good oils out there, my preference is the Denis Wick oil, or Hetman synthetic light oil. 2. I have schilke 52d, which recently fell and it got chipped, I'm looking into the Ultra X series because I heard it really focused your lower register and made it easier to play in the higher register and it helped with not getting chopped so quickly. My main question with this one is if the ultra X'S had comfortable rims like the 52d. 1. Use a variety of the exercises, but set yourself a target of what to achieve every day. The opening couple of sections are great for our warm up, then use a metronome for all the technical sections initially, and make sure you cover particulation, legato exercises,and then select three chapters per day to work on, then very these. Then look at working on one or two of the 14 large exercises at the end of the book, and maybe one solo, then rotate these as progress comes. 2. sorry to hear that you dropped your Schilke mouthpiece, and perhaps it's a sign from God you need to switch to an Ultra I think you should try the Ultra4 or Ultra 4X, super comfortable rim as well. Thank you Steven! Btw where can I message you to send you my email? 1. 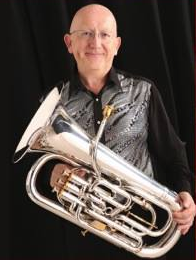 If Besson euphoniums ceased to exist, (including old brand Bessons) what euphonium would you play, and why? 2. At what point in your life could you draw the line between being an amateur and a professional? 1. As you know I adore my Besson euphonium and I'm heavily involved with research and development for the company, so in the highly unlikely event that this instrument was no longer available I would of course test all others to see which was the next best. It's hypothetical to make that decision now as I'm sure you can appreciate. It would also give nice publicity to rival brands! 2. good question, I think when I stopped my high school teaching around 1990 I saw myself as a full-time professional, but from about five years before that I certainly realised where I was going with the euphonium,if this makes sense. 1. When is your next recital in the Midlands or Warwickshire? thanks for the nice greeting. 3. Wonderful idea - we'd have to have something specially written !!! Can I just ask one? 1. Who's your biggest inspiration NOT as a euphonist, but as an entertainer? 1. A very fine question - I really don't know the answer...let me get back to you on this one! 1. Are there any disadvantages for you in being married to another world-class euphonium soloist? 2. If they came to you and said, "You can't play the euphonium anymore, nor teach it," what would you do with yourself? What would you become? Ha! Why, MI-5, of course! And, yes, I KNOW you'd keep playing euphonium, playing duets with Misa, and sharing your (musical) wealth! 1. How do you do it all? 2. Your favourite instrument (apart from the euph). 1. I don't really know, when I have tons of energy, I don't need much sleep, and tried to get everything done without causing too much stress to myself and the people around me :-)Think if you really love what you do, you always find time, and always can enjoy it. 3. Mahler's 2nd Symphony . Thanks for the questions ! 1. I think you have a busy life and you haven?t got time everyday to practice to much! So, when you warm-up and practice, what are the most important things you do? 2. What is a good routine? 3. any advice to study the high register? I'm happy to see you in Brazil in January also. 1. traditionally, on the older Sovereigns these notes were very high, its just a design fault, that was a result of a balance between getting a big open sound, response, and some sharp partials appeared. 2. The new large bore was undoubtedly a factor, but I think they've been sharp in this region for some time before that. Even though I take lessons with you I could not resist asking you 3 questions. 1. What advice would you offer to those of us nearing the end of our music degree in terms of progression to the next level? 2. Throughout your career as a euphonium player where has your inspiration come from to keep things new in terms of commissioning music and promoting the euphonium? 3. As a world renown teacher what bit of advice would you class as most important for your students? Manuel Di Luca Thank you so much, Steven! It's going to be a pleasure talk about all of these advices in person! See you soon! 1. well, it depends what you mean by the next level. I'm guessing the next level could be the real world, and there you have to find something that you can do that uses your talents, builds the foundations of a career, and hopefully earn you some money. Each musician must be honest with themselves about where their prospects lie and what opportunities are out there.I see too many students who only start to make these decisions at the moment that they have to, rather than planning strategically ahead. 2. as many people know my inspiration originally came from the fact that everybody told me it was impossible to make a living playing the euphonium! I was determined that it must be possible as the instrument is special enough to find a position in the world for those dedicated enough to play it, and play it well. Not much has changed in terms of this inspiration and motivation and with plenty of concerts and workshops in the diary, there's always the motivation to do the best possible job at each venue and country. 1. I know many peole that want to start to play euphonium not early but 19, 20 years old or more. What kind of instrument and mouthpiece you recommend in this case and what is the best studies to develop more quickly? 2. Here in Brazil we there aren't many symphonic bands and there is not brass bands. How to keep motivated euphonium students, since the labor market is so scarce. 3. In my college had much more music theory than practice of euphonium, and many papers to write which left little time Daily studies. What types of study do you recommend for those who have little time to study and need to keep the technical and musical quality in day? 1. if the player is able to fill the instrument with sound, and is taught correctly, there is no reason why a person of this age should not start with a high-quality instrument, 4v compensating. This often depends on budget however. A new player may not wish to invest in such an instrument. In which case a four valve non-compensating instrument at a good price might be a good option. Thank you very, very much Steven Mead. I hope to see you soon to discuss this topics better and other things about our beautiful instrument. Best regards. Just one Q for the moment; there is a lot of development in 'material' choices for the euphonium (bell) lately aka the (bass)trombone world; the Besson Prestige is still 'yellow' and no so 'heavy' (I believe). Can you give us some thoughts about this issue...? thanks..
hi, thanks for the question. The Besson Prestige bell is the brass, and not really heavy. 967 is 0.1 mm thinner than 2052. My thoughts are that these work great, but we are scheduling tests on different materials during 2015. The sound of our instruments are quite famous, and rightly so. But you never know, we could be using different material on future models. 1. You look always so relaxed on stage when you perform, what I believe is one important aspect why listening to your playing is so enjoyable. I wonder: did or do you ever get nervous when going on stage (or beforehand)? Is there an advice you could give to players who are suffering from nerves or stage-fright? 2. I believe many euphonium players get sooner or later in their life in a situation where there are supposed to teach. I know it is a complex topic, but maybe you have some advice how to develop and improve as a teacher? 3. If you could record a CD and also commission a new piece without limitations of budget and time, what would you record and what composer would you consider to approach for a commssion? Thank you very much in advance and all the best! Hope you are well! And hope to see you again soon! 1. I'm happy to think that I look relaxed when I play, and sometimes I am, but not always! The confidence of course is purely a psychological state that we can create for ourselves,and we learn to build upon this as good performances go by. We also learn from the not so good performances, but we must try to get stronger step-by-step, year by year. There is no substitute for good preparation, solid practice, methodical approach to learning music, and this is where the confidence comes from, knowing we can do it when it matters. Thinking only positive thoughts, if this is possible, is the one solid piece of advice. Do not allow negative thinking to creep into your psyche! 3. over the years I've always been motivated by interesting recording projects, rather than simply recording music that is out there. I recorded with many different ensembles, and each creates variety, new challenges for me as a musician, how to play with a brass ensemble, wind quintet, trombone quartet, how to record with a cathedral organ etc.I have a variety of projects that I'd like to do in the next 5 to 10 years, some of them extremely ambitious, and probably very expensive. But I will get there I hope. There are many composers that I'd like to commission, and I will give you more news of some future projects coming soon. I hope this is okay Wolfgang. 1. Do you recomend study music to everybody or only for the best students? 1. I think you mean should everybody study music seriously, with a view to a career, or only the best students. It's a good question, if I understand you correctly, and the music world has never been so competitive in terms of employment as it is now especially with so many cutbacks for music funding, sadly. If music is what you have to do in your life, then you have to study it, and take it to the highest level. If you enjoy music but can imagine doing something else with your life, it's probably best you treat it as a hobby. 2. it's a combination of 'motivations' that help you play music professionally, especially as a soloist. It's hard to quantify success, as I'm not competing any more. I play music for people, and I teach people, it's really that simple. If I feel I've done a good job and if people tell me after a concert how much they've enjoyed it and why, I can have a nice feeling for a short time, and if my students have success, and play beautifully, then I rate this as a success too. I enjoy it all very much, and despite some of the hassles with travelling I wouldn't swap it for anything. 3. yes I have a big secret, is called hard work and dedication :-)you also need some luck in your career, and I've had quite a lot I think, especially in the early 1980s when I met Howard Snell and the Desford Band, those years were amazing and so many doors opened for me during this time.I was very fortunate that in my first job the Headmaster loved brass bands, and gave me so many opportunities to work with the students. He also gave me time off for some of my first tours, I shall be for ever grateful to him for allowing me to make a transition from high school teacher to professional soloists so easily. Luck aside, it's the business of practice, and really focusing on how to do your job the very best you can. Your English is excellent, a million times better than my Spanish! 1. What weaknesses as a performer have you had to overcome to get where you are? 2. Where's the favorite place you've traveled? 3. What would you define as the pivotal moment in your career? Was the change from amateur to professional gradual, or sudden? Steven Mead: Hi Jacob Barnby , Thanks for the questions. 1. Well, like all musicians we all have to work on our weaknesses, so they don't detract from what we try to do musically, And everyone has their weaknesses, whether they like to admit it or not. I guess with me it's a question of keeping the finger technique as good as it can be, and, as years progress working on tongue speed and stamina. I'm quite lucky in that I've always worked on breathing techniques, and always had a good feeling for the melodic line.also, in terms of performances, I have always had to try to keep the nerves in check, and found various solutions to this over the years. 3. I think the pivotal moment was when I gave up the high school teaching which I enjoyed so much to venture out as a freelance professional soloist and teacher. I kind of knew it would work, but it was still a bold step, going away from the safety of a 'normal' and regular job. 1. What are the biggest health concerns you face as a professional musician? 2. What is your funniest airport story? 3. What should we as Euphonium players do when we are faced with criticism about the legitimacy of our instrument just because we haven't been accepted in a major orchestral sense? 1. The biggest health concern probably is over work, not resting enough, not listening to what doctors family and friends tell you! I think daily exercise is the most important thing I can advise, as it's so easy to get swept along with high level musical activity, and sometimes the stress that goes with that, can be dangerous. Try to keep a good perspective on what you do. 2. there are many, but briefly, practising on the top floor of a multistorey carpark in San Francisco, being approached by a guy who I thought looked a little suspicious, only to find he wanted to come and listen to the music. We became friends over the next 20 minutes, and talked about life and music. A touching moment! 1. What is the key word that you think a student should have always keep in mind? 2. What hopes and expectations you have for the future of the euphonium in music? 3. Can I get your autograph? 2. well from my perspective, the 'improvements' that have been seen in the euphonium world over the last 25 years have been considerable. Instrument design, mouthpiece design, the quality of the music written for us, performance opportunities around the world, the state of music and higher education, in many countries but not all, are better. I'm incredibly optimistic, but we need players who do more than just play the instrument, or there is a danger things could go backwards. Historically we are playing catch-up with the other brass instruments, and if we keep going we could even overtake the popularity of some more established instruments, but many things have to move at an equal basis, higher education, study resources, performance opportunities in particular, and educated players, like I said, who are prepared to do more than just play it!! 3. with pleasure, just send me a message with your mailing address, and I'll get a signed photo to you. Best wishes for the future. I don't know if you're going to the course I'm giving in Brazil in January? Hi Steven, I'm so excited can meet you in Singapore. Hope my question are not missing this awesome movement Here the question. 1. How did you practice on running notes while getting the new piece? 2. Any advice for travelling with euphonium ? 3. What's the food you want to try first in Singapore? thanks for the message, and I'm very much looking forward to meeting you in Singapore in a couple of weeks. 2. i'm often asked about travelling with a euphonium, especially plane travel which is the most difficult, especially with some airlines. I always carry my instrument in a gig bag, and almost never have problems. Where is there is a difficulty I can normally negotiate my way out of trouble. It is good to know the regulations that certain airlines have towards musical so you know how to prepare. Make sure you always have your instrument in sight, if you , never leave it casually lying around at an airport, or restaurant etc as somebody is sure to give it a kick sometime! Hi Steven, have you got any tips for warming up please? I don't always have the time to do it properly due to hectic life. I used to used the Remmington and lately Alwyn Green's from Eurythmics, but they take at least half an hour and sometimes I only have a few mins before band! 1. When did you really start getting serious about your playing? 2. I love your vibrato and tone but i can't seem to get a great vibrato like yours, what could i do to improve it drastically. 3. Did you ever do marching band and if so what how fun was it for you? 2. vibrato is a very personal craft, and different people have a concept of how they want to 'beautify' the sound. It's a very divisive topic amongst teachers and the brass fraternity, but this is for another article! Talking of articles, if you go to my website www.euphonium.net, then to 'Articles' and then scroll down the page you'll find an article I did on vibrato many years ago. I hope you'll still find it interesting. Nathan Kim: Thanks for sharing! Hello all, the Question Time session finished on December 2, thanks all of you for the questions and I hope you enjoyed it. The next one I'll be doing will be video replies on technical topics, I'll post information at the weekend. Follow Steven on his website, Euphonium.net.